This year’s flu season was particularly aggressive and virulent. Many people were affected, with this particular strain of flu, the most vulnerable of all were families with young children. In large part, the problem is that many people don’t pay attention to all the factors contributing to the spread of the flu. The most common and most overlooked factor is air pollution. The fact is that poor indoor air quality can have adverse effects on your health. Sometimes it is the only factor that contributes to your illness. Since we spend most of our time indoors, ensuring indoor air quality is vital. Unfortunately, the air indoors contains so much airborne dirt, pet dander, pollen, viruses, chemicals, dust, bacteria, and other pollutants that it can lead to eye irritation, allergies, fatigue or even headaches. Needless to say, this air pollution considerably increases the chances of getting hit with the flu or other malady. Indoor Air Quality – Why Should You Care? Poor air quality can make your flu get worse. Both indoor pollutants and cold viruses trigger your body to produce inflammatory agents. This can worsen your illness and force your recovery to take much longer. When the indoor air quality makes you get sick, it affects your daily routine. It hampers your productivity at work and costs you money in terms of medication and doctor visits. Improving indoor air quality is not difficult, and you can save yourself from the flu and other health issues by making some small changes in your home. The first step is to improve your cleaning habits. Assess your ventilation system and eliminate the factors contributing to poor air quality. Invest in a whole house air filtration system and/or humidifier. Keep your HVAC systems in proper working condition. Change your air filters after every three months and do not position furniture in such a way that would block the air vents. Try to keep the indoor humidity level at 50%. Make sure you are properly cleaning and vacuuming your home to avoid the buildup of dirt and dust. Put a floor mat at your home entrance. This will help in trapping pollutants before they enter your living area. Cut down toxin cleaners such as ammonia and bleach and replace with mild cleaners such as mixing of water and vinegar. While all of this may not guarantee the prevention of the flu or colds, it will definitely reduce your chances of becoming ill. Your health is obviously extremely important to reduce absences and to maintain work performance. So do everything you can to ensure good indoor air quality so that you can take care of yourself and your family. 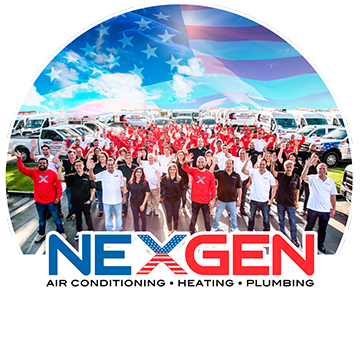 Nexgen Air serves clients all over Southern California, from Oxnard to Indio and from the High Desert to Temecula, improving homes and the lives of our customers. If you’re A/C, heating system, or water heater needs servicing, call Nexgen Air today: 833-3NEXGEN!